Germany nearly won it all on the water after losing so much off of it. 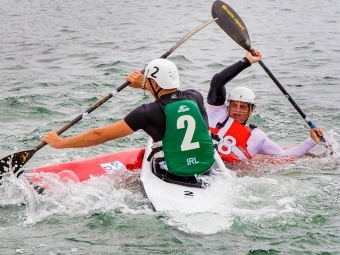 Only a 3-2 loss to Great Britain in the men's under-21 final prevented Germany from sweeping all four divisions at the 2018 International Canoe Federation Canoe Polo World Championships in Welland. Germany scored four unanswered goals and upended defending gold medallist Italy 4-1 for its first-ever senior men's championship. For the grief-stricken Germans, Sunday's come-from-behind victory in the final game at the five-day, 68-team competition on the Welland International Flatwater Centre North Course was especially emotional. It came two weeks after team member Fiete Junge died of meningitis. Members of the senior men's team dedicated the gold medal in the memory of the 26-year-old law student by displaying his No. 10 vest in their victory celebration Sunday. "It was really hard for the whole team, especially for the seniors," team leader Birka Rusch said. She said while the team was "hurting a lot" and attended a "grief ceremony" only two days before flying to Canada, they never considered dropping out of the biennial competition following Junge's sudden death on the eve of the world championships. "We didn't know what would be at the end, we did it step by step." The German senior men's team rebounded from a fourth-place finish at the last world championships two years ago in Siracusa, Italy, while the German senior women, runners-up to New Zealand in 2016, won their sixth world championship and first since 2014 with a 3-1 victory over Great Britain. The International Canoe Federation has held world canoe championships every second year since 1994. Germany has become a hotbed for a discipline that is campaigning to become a demonstration at an upcoming Summer Olympics. In the 13 worlds since the inaugural event in Sheffield, England, the German senior men have earned five silver medals, three bronze and, now, one gold. Germany's senior women have six gold, five silver and one bronze. The German under-21 teams have enjoyed even more success since championships for those divisions were first held in 2012. Germany improved to 4-for-4 in gold medals with a 5-1 victory over Poland in the women's flight, while the men followed up two bronze medals by settling for their second silver in a row. Given that track record, Germany came into the competition hoping to compete for a medal, but Rusch pointed out the same could be said of the other paddling powerhouses in Europe. "Germany belongs with the really top teams," she said. "You can expect Spain, you can expect France or even Italy, we are all very close. "So you never know what is at the end but, of course, we always hope to get to the right end." Bronze medallists in the senior divisions were Spain, men's, 5-4 victors over France; and Italy, women's, 4-1 over France. Italy defeated Poland 6-1 in the under-21 men's third-place final, and New Zealand edged Great Britain 3-2 for the under-21 women's bronze medal. Host Canada placed 18th among 23 senior men's teams, 15th among 19 senior women's teams, 15th among 16 under-21 men's teams and eighth among 10 under-21 women's squads. Stephen Gale, the team leader and high-performance director for Canoe Polo Canada, said the sport is still developing in Canada. "Our expectations are just to show some development and improvement in our position every single year," he said. "All teams are doing what we expected of them in their groups at the moment." Still, the Canadian athletes came into the second-ever worlds held in Canada and first since Edmonton was the host 2008 feeling pressure as the home team. "It's the world championships, there is always pressure," he said. Gale praised Welland for doing an "amazing job of showcasing the sport for us." "They are talking about starting a club here and the ICF is leaving some nets here so we can help develop new canoe polo clubs." The 2020 world canoe polo championships will be held in Rome.